Where Did Internet Explorer's Browser Share Go? Yesterday, browser market share figures came out from Net Applications, and the big news is how Chrome is moving up the ranks at the expense of Microsoft’s Internet Explorer and even Firefox, compared to December. But you have to look further back to get a sense of what is really happening. The various flavors of Internet Explorer (IE6, IE7, and IE8) together have 62.1 percent market share, down from 68.5 percent last March. That is a 6.4 percent drop in about a year. During the same period Chrome went from 1.6 percent share to 5.2 percent. Firefox and Safari each gained about a percentage point each over the same period to 24.4 percent and 4.5 percent, respectively. (Although Firefox is a tiny bit down since November, when it peaked at 24.7 percent). If you add up the gains from those three—Chrome, Firefox, and Safari—that is where most of IE’s share went. But even that doesn’t tell the whole story because if you look at share of individual versions of the different browsers, you can see another dynamic in play. Namely, a big part of the share shift can also be explained by the uneven rate at which people abandon older browsers like IE6 for newer ones like IE8 or Chrome. 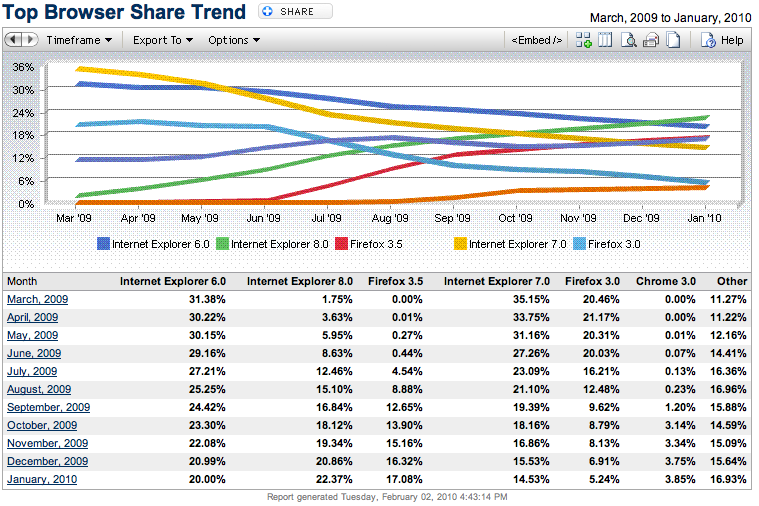 Let’s look at the share shifts just among IE6, IE7, and IE8. The pitchforks are out for IE6, people hate it and Websites (especially those run by Google) think the sooner it dies, the better. Even Microsoft wants people to move away from IE6. IE6’s individual market share has dropped by about 11 points since March, 2009, from 31.4 percent to 20 percent. Meanwhile, IE8 took almost twice as much share as IE6 lost, it’s up almost 21 points from almost nothing to 22.4 percent share. So why did IE show an overall drop? You can blame poor old IE7, which lost exactly as much as IE8 gained, going from 35.2 percent to 14.5 percent share. But taken alone, IE8 actually gained more than any other browser during the period (up 20.6 percent), followed by Firefox 3.5 (up 17.1 percent). Chrome’s 5.2 percent share gain was spread across its Windows and Mac versions. So IE8 is making stronger gains than you might think from simply looking at the overall IE share numbers. In fact, in January, it finally surpassed IE6 in market share and is now the largest single browser. As IE6 and IE7 continue to dwindle, IE8 needs to capture as much of those legacy users as it can. With almost 35 percent share left between them, IE8 will no doubt continue to see rapid individual share growth simply by getting people using older versions of IE to upgrade. It helps that IE8 comes pre-installed with the Windows 7 operating system also. But those users are also prime targets for Chrome and Firefox (which is still going through its own transition from 3.0 to 3.5). Chrome, in particular, has the most to gain here. It only needs another 5 percent to double its market share, whereas IE8 can win over another 20 percent and still see IE’s overall share go down. It remains an open question where the overall shares will settle when all of this shakes out over the next year or so.